I am ridiculously terrible at sports. I’m 26 years old and I still struggle throwing a Frisbee. However, when dry land becomes water or gets covered with a nice blanket of snow, things tend to go a little better. Just over a week ago, I spent two and a half incredible days by Lake Bled in Slovenia. I’d been dreaming of visiting the area for nearly 15 years (thanks to the popularity of vampire fiction during my teenage years), so I knew I wanted to go all in and get the most out of my time there. Situated right by the majestic Julian Alps, Bled has no shortage of adrenaline-filled and adventurous activities for visitors to choose from. While I didn’t want to push my luck with a day of canyoning, (I am the ultimate klutz), I knew I wanted to do something a little more out of the ordinary. So when I learned that it’s possible to stand up paddle board on Lake Bled, I knew I had to give it a shot. While you can rent a SUP (Stand Up Paddle board) for an hourly rate from many facilities around the lake, I contacted the Slovenian company, Bananaway, to take part in their 2 hour Lake Bled Tour. And their tour was definitely the right one for me! 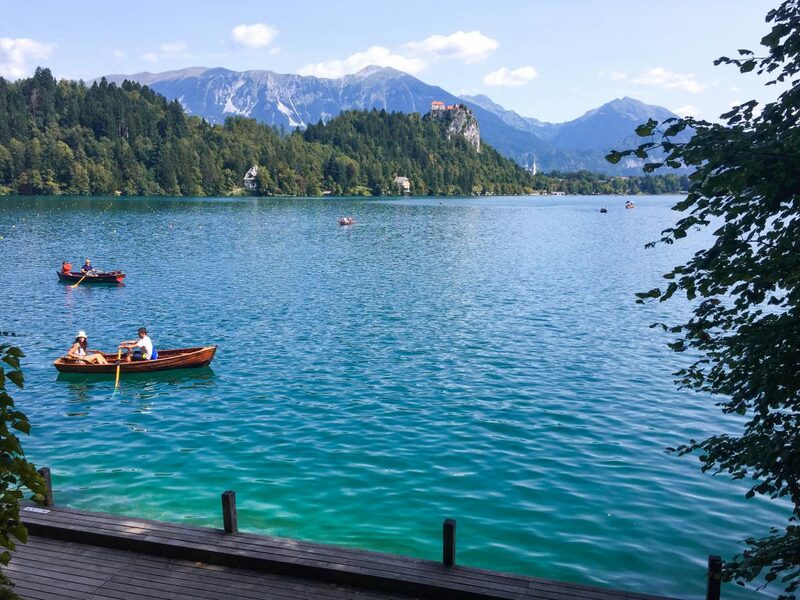 Read on to learn more about Bananway and paddling on Lake Bled! I was Bananaway’s guest on their SUP Lake Bled Short Tour, but all stories, thoughts, and experiences are my own. On a sunny August morning just after 9 am, I headed out of my hostel in Bled and walked over to Velika Zaka Bay on the other side of the lake (it’s in front of Camping Bled). There, I met up with Iris, the day’s tour leader and instructor. At the start of the tour, Iris explained the basics of stand up paddle boarding, and gave a quick lesson. Since I had already given paddle boarding a try before, we were soon heading out of the bay and making our way around the lake. With Iris’ help, I was easily and quickly able to take my paddle boarding skills to the next level. With my newfound abilities to steer and pick up speed, I was almost feeling like a pro. Maybe I almost looked like one? And can you believe that clumsy me didn’t fall into the lake even once? While paddling around the lake, Iris answered any questions I had about the area and Bananaway. Armed with a GoPro, she took more than a handful of photos to document the experience (which I’m extremely thankful for since none of my cameras would have had a good relationship with water). 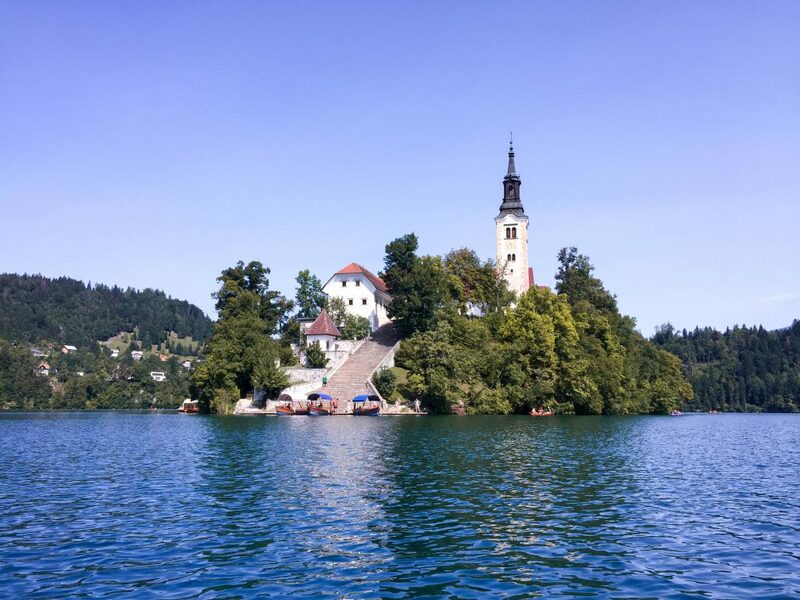 Near the end of the tour, we stopped at Bled Island, where I had the opportunity to walk around, climb up the famous 99 steps, and take a peek into the island’s Church of the Assumption. The tour culminated on a fun note where, in typical Bananaway fashion, I was provided with a banana to snack on. (The company’s name is Bananaway after all). 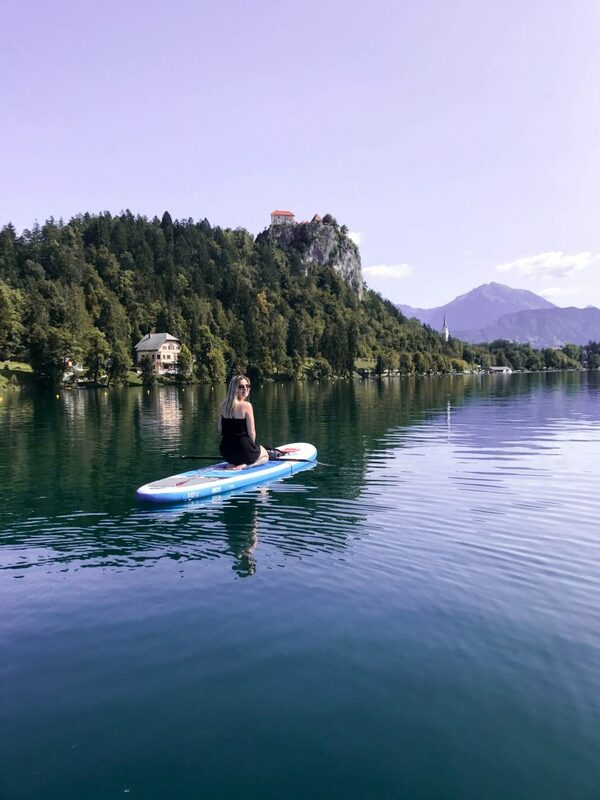 Why Should I Consider Paddle Boarding on Lake Bled? During my time in Bled, I walked around the lake and made it my mission to catch the best bird’s-eye views of the area from Bled Castle and the Ojstrica viewpoint. Yet, paddle boarding around the lake still remains one of my favourite experiences in the area. Nothing compares to standing in the middle of the lake surrounded by its calm and deep turquoise waters. 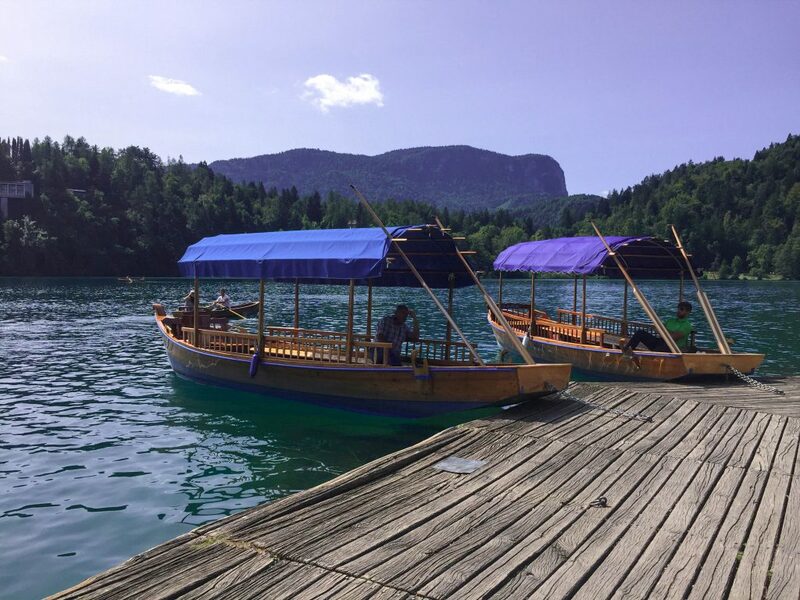 Paddling to Bled Island is also a great alternative to taking the quick and usually crowded Pletna boat. Having unlimited access to unobscured views of all parts of the lake and island is nothing short of fantastic too. No trees, bushes, buildings or people blocking my view of the island here! A snap featuring the traditional Pletna Boats. Have the undivided attention of a trained SUP instructor to make your paddling experience as enjoyable and struggle-free as possible. Really get the opportunity to practice and develop your SUP technique. Have your paddling experience documented for you. Photos are typically shared with you within 24 hours. Get an insider’s perspective and have fun conversations about the area with numerous recommendations covering what to do, see, and eat. Can keep your belongings safe during the tour in Bananway’s van. Look at that view of Bled Castle from the lake! 30 minutes into the tour, going from sitting, standing, and kneeling on a paddle board was no longer a cause of concern. Now, I honestly enjoy paddle boarding and hope to commit more to the sport in the future! My slightly crazy far-fetched dream is to work on my driving skills (does anyone else have a love-hate relationship with driving?) and make my way around Europe’s top lakes with an inflatable paddle board on hand – oh, and a four-legged partner in crime canine to take on board. Have you seen @breezeturner’s Instagram account? I’ve obsessed with it. By paddling with Bananaway, I had the chance to take a step in the dream direction. Their Lake Bled Tour gave me the chance to become a more confident paddle boarder in the most beautiful of settings. Of course, it also gave me the opportunity to visit the lovely Bled Island, which I absolutely had to do (they did that in Kostova’s The Historian, you know). The view from Bled Island. Bring a water bottle and hat because you’ll be out in the sun. If you are wearing just a bathing suit and plan on visiting Bled Island, bring some sort of cover-up. It’s necessary because the island is home to a church. If you paddle to the island, you can only dismount at the back. The steps are for Pletna boats. Bring €6-12 if you want to enter the church and have ice cream on the island. Entering the church costs €6. To keep your money safe, you can take a dry bag/sack with you for the trip. A small dry sack should be able to hold your cover up, money and phone. While I bought mine in a local Swedish shop, you can check this one out by Earth Pak on Amazon. If you’re staying in Bled, give yourself at least 40 minutes to walk around the lake to Velika Zaka Bay (if you want to rent a paddle board or take part in a tour from there). The lake is generally calm and is clean, so don’t sweat it if you take a tumble. Relaxing on the famous Bled Island steps. Want to Learn More about Bananaway? If you’re intrigued by Bananaway’s SUP tours, you should know that you don’t have to be in Bled to go on one. The Slovenian sightseeing company also offers tours in the Soca Valley, Bohinj, Piran, and Ljubljana. As well, Bananaway organizes SUP team building activities for companies to take part in. Click here to check out their website for more information! You can also learn more about Bananaway, such as the organization’s recent participation in 100 SUP on the Ljubljanica River, on their Facebook page. (100 SUP on the Ljubljanica River gathered 100 paddle boarders in Ljubljana to paddle down and clean up the capital city’s river). Want to know what else you can do in and around Bled? 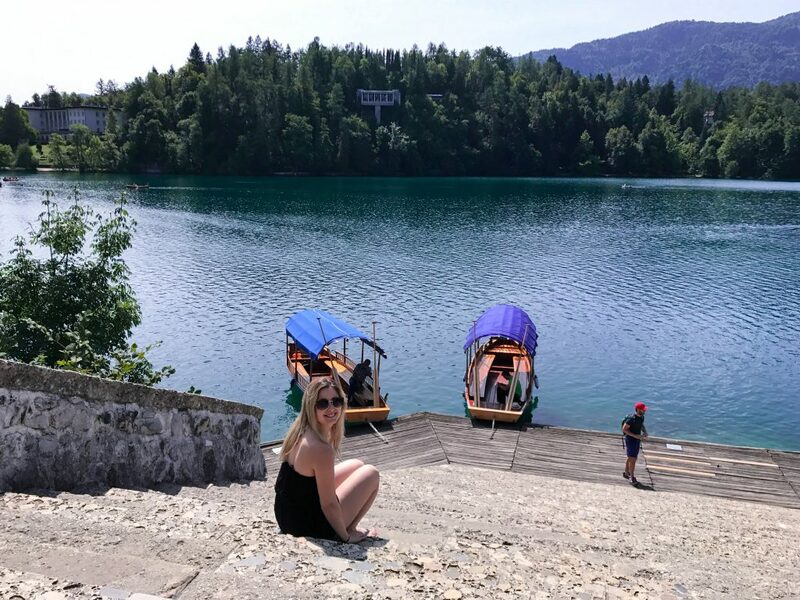 Check out my post sharing 7 amazingly memorable things to do in Bled by clicking here. Have you ever given stand up paddle boarding a shot? Where? If you haven’t, would you like to? Share your thoughts and experiences in the comments section below! Again, Bananaway hosted me on their SUP Lake Bled Short Tour, but all stories, thoughts, and experiences are my own. I hadn’t even thought about SUP on Lake Bled! I am hoping to make it there next year and will have to do this! I didn’t know it was possible there until a week before my trip too! I hope you get the chance to SUP Lake Bled! This sounds like so much fun! I’ve never done SUP, but I’m really eager to try. What a beautiful spot! I hope you get to try! SUP really is a lot of fun (and relaxing). Such an extensive and detailed post! I was just here 2 months ago – shame I didn’t do the banana boat, looks like so much fun! Thank you so much! Bananaway’s tour was a blast, but they do tours in other parts of Slovenia and other European cities (such as Venice) too! First, love your pictures. Outstanding. I have never done the stand up board thing before but have wanted to for years. You picked a beautiful place to do so. Great post, thank you! Thank you so much! And I hope you give it a try – it’s really not as hard as it looks! Thank you so much! Yes, having a dry bag was incredibly useful! We spent some time in the capital en route to Portugal (drove through Slovenia) and we so wanted to visit Lake Bled. Time was against us, so we didn’t get to see it 🙁 We are planning on visiting next summer though, but we never thought of SUP on Lake Bled. Too cool! Bled is definitely a beautiful area! I hope you get to experience it next year!